Miguel Ángel Rojas, Serie Faenza: Tres en platea, 1979, Silver Gelatin on aluminum, 32 1/4 x 48 in. / 82 x 122 cm. 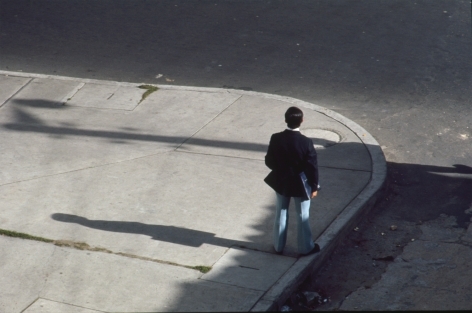 Miguel Ángel Rojas, El Freddy, 1979/2008. Digital image printed from 35mm negative, 45 in. x 64 3/8 in. Miguel Ángel Rojas, Dos Mundos, 2015. Two channel video with audio, 7 min. Miguel Ángel Rojas, Economia intervenida, Ensamblaje. Video, coca leaf powder, gold leaf and aluminum, 43 5/16 in. x 64 3/16 in. Miguel Ángel Rojas, Machu Picchu, 2013. Dollar bills and coca leaves on paper, 19 7/8 x 66 16/16 in. 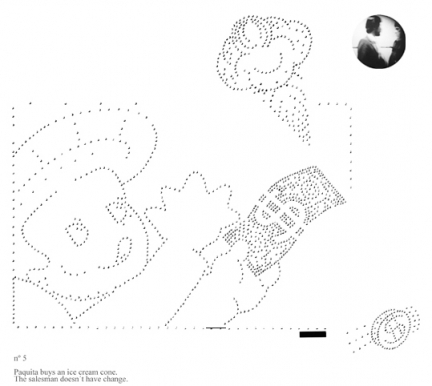 Miguel Ángel Rojas, Machu Picchu, detail, 2013, Dollar bills and coca leaves on paper, 19 7/8 x 66 16/16 in. 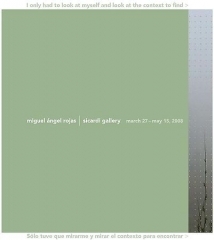 Miguel Ángel Rojas, Nowadays, 2001/2008. Coca leaves mounted on acetate, 39 3/8 x 275 1/2 in., Installation view. 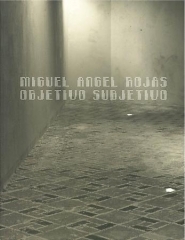 Miguel Ángel Rojas, Parceros, 2007/2008. Peony seeds on rubber and aluminum, 23.6 in. x 35.4 in. 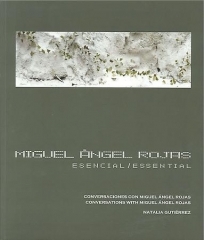 Miguel Ángel Rojas, Sin frío permanente (Edition of 2 + 1AP), 2012. 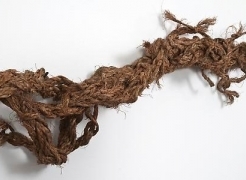 Impression with coca leaf powder on jute, 96 1/2 x 53 1/8 in. / 245 x 135 cm. Miguel Ángel Rojas, Por Pan, 2014 Exhibition, El Cuerpo Sutil, Sicardi Gallery, Houston, TX. Miguel Ángel Rojas, Selva Cosmopolitica, 2014, Bogotá, Colombia. Miguel Ángel Rojas, Les Rencontres D'Arles, 2013, Arles, France. Miguel Ángel Rojas is a conceptual and multimedia artist whose work addresses subjective experience, identity, and politics. His projects have included indictments of international drug trafficking and violence, and much of his work focuses upon experiences of marginality. In 1964, he began studying architecture at the Pontificia Universidad Javeriana, where he remained for six semesters. Deciding not to pursue a career in architecture, Rojas enrolled at the School of Fine Arts at Universidad Nacional de Colombia in Bogotá in 1969. His earliest experiments with long-exposure photographic portraits and self-portraits began during this period in the mid-1960s, and continued throughout the 1970s. In 1973, he began one of his most important series of photographs, the Faenza series. Rojas took these photographs—of encounters between gay men at B-movie theaters in Bogotá—secretly, hiding his camera in a suitcase or under a jacket. The resulting images are ghostly records of the affective and physical experiences of a largely invisible community. The series also marks Rojas’s first exploration of his own subjectivity as central to his work, and it was his first extended foray into photography “at a time when photography was not a medium considered part of the great canon of the plastic arts,” he recalls. The freedom that came with working outside of the accepted subject matter and materials of fine arts allowed Rojas the space to make what he would call “leaps in the dark” as he established his formative style. Throughout the 1970s and 1980s Rojas also worked with engraving, drawing, video, intaglio, stitching, and photographic reductions. Miguel Ángel Rojas lives and works in Bogotá.